Orthodox Baptism: a “Private” or “Communal” Affair? 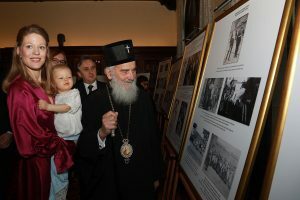 His Holiness Patriarch Irinej of Serbia christened young Prince Stefan, the son of Their Royal Highnesses Prince Philip and Princess Danica, at the Royal Chapel of St. Andrew the First-Called in the Royal Compound in Dedinje, Belgrade, Serbia. Prince Stefan’s godparents are HRH Prince Alexander (twin brother of HRH Prince Philip), Mrs. Petra Lazarevic and Mr. Dusan Antunovic, long standing family friends of the Royal Couple Prince Philip and Princess Danica. Joining the Patriarch in officiating the christening was His Grace Bishop Lavrentije of Sabac who married TRH Crown Prince Alexander and Crown Princess Katherine in 1985, and also christened Princes Philip and Alexander. After the christening, His Royal Highness Prince Stefan acquired the right and obligation to be the bearer of the Grand Cross of the Royal Order of Karadjordje Star (1st class), which is the highest decoration of the Royal House. Besides the parents of Prince Stefan, TRH Prince Philip and Princess Danica, the christening ceremony was attended by Their Royal Highnesses Crown Prince Alexander and Crown Princess Katherine, Prince Stefan’s Godfather His Royal Highness Prince Alexander, Her Royal Highness Princess Maria da Gloria of Orleans and Bragança, Duchess of Segorbe, HRH Princess Anne of France, godmother of HRH Prince Philip, Mrs. Maja Gojkovic, President of the National Assembly of Serbia, Princess Danica’s parents Beba and Cile Marinkovic, Their Royal Highnesses’ son David Andrews with spouse Dr. Angeliki Andrews Margariti and their son Alexander Andrews, Mrs. Betty Roumeliotis, sister of HRH Crown Princess Katherine. On the occasion of Prince Stefan’s christening, at the Royal Palace there was presented the exhibition “Royal Ceremonies” which shows the photographs of many ceremonies like the coronation of HM King Peter I, the wedding of Their Majesties King Alexander I and Queen Maria, christening of HM King Peter II, wedding of Their Majesties King Peter II and Queen Alexandra, christening of HRH Crown Prince Alexander, wedding of TRH Crown Prince Alexander and Crown Princess Katherine, christening of HRH Hereditary Prince Peter, the christening of TRH Prince Philip and Prince Alexander, and more. HRH Prince Stefan was born in Belgrade, Serbia on Sunday, 25 February 2018 at 10:30am. With the blessing of His Holiness Patriarch Irinej of Serbia, the bells of Belgrade’s St. Sava Temple tolled heralding the birth of the newborn member of the Serbian Royal Family. That was the first time that the 49 bells of the biggest orthodox temple in the Balkans announced such a birth. The bells of St. George church in Oplenac and Zica monastery tolled heralding the birth, too. This birth of a male child was the first one in the Royal Family in Serbia after 90 years when HRH Prince Tomislav was born in Belgrade, who was the brother of HM King Peter II, the grandfather of HRH Prince Philip.